Banasthali University Admission 2019: The Banasthali University will organize the exam of the for all the eligible candidates to take admission in BA BSC BCOM BTech BSc BA LLB MA MCOM MCA MSc etc various UG PG and Ph.D. programmes. Latest Update: Banasthali University Admission 2019 Application Form Available for most of the Programs. Latest Update: Exam Schedule Announced!! Check Program wise Exam Dates below. Latest Update: Banasthali University Admission 2019 Official Notification Released!! Check it just Below. For the Admission Process, only the female candidates are eligible. The candidates will get the admission on the basis of the merit list prepared by the university. 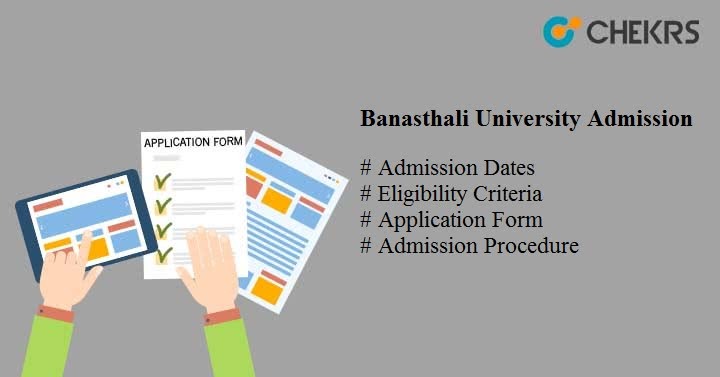 Get here all the information regarding the Banasthali University Admission 2019. The candidates will be shortlisted for the aptitude test for taking the final admission on the basis of the marks. The university didn’t conduct any of the Entrance Exams for offering admission in any of the courses. Check here about the complete information regarding the Banasthali Vidyapith Admission 2019. Before filling the form student needs to know the details about the dates. so we are giving here the dates which are expected. We will provide the official dates after it released by the university. The Banasthali Vidyapith Admission Last Date is given below under the table. B.Tech. (CS/ EC/ EI/ EE/ IT/ BT/ CE/ MT)/ B.Pharm. Before filling the Application Form candidates needs to fulfill the eligibility criteria. In any of the case if the candidates do not fulfill it then their application form is rejected. The Banasthali Vidyapith Eligibility Criteria is as follows. Those candidates who wish to fill the application form through the offline mode they can get it from the respective centers of the university along with the prospectus on cash payment. The application form will be available from the Feb. the first week 2019. The last date of filling the application form is April last week 2019. Candidates also required to upload the recent photograph in the prescribed format. Check the status of the application form after filling it successfully. For the entire category i.e. general, ST, SC, OBC the Banasthali Vidyapith Admission Fees is Rs. 800/-. The application fee can be submitted through DD to the address given below. The Banasthali University Admission Process is very simple. Firstly candidates require to fill the application form then they require to appear in the aptitude test which is conducted by the university and at last they require to participate in the counselling round and finally complete all the admission formalities. The university conducts its own test called Banasthali University Aptitude Test for those candidates only who are shortlisted through the application form. For the various courses, the test is conducted on different dates. This time it is expected that the university will conduct its test in the month of June 2019. The university releases the separate merit list for each and every course after the aptitude test is finished. On the basis of the marks filled by the candidates in the application form, the merit list is prepared. Candidates can check the Banasthali University Merit List through the online mode on the official portal of the university. On the basis of the merit list prepared by the university, the counselling is organized. After the few days of the examination i.e. aptitude test the Banasthali University Counselling schedule is provided to the candidates. In the couselling round, the candidates allotted the seats as per the preferences and the marks filled by the candidates. After the Counselling Process is completed candidates required to reach the allotted center for the admission. Candidates need to carry the original document and the Seat Allotment letter along with the Banasthali University Admission 2019 Fees. The session will start from the August 2019. That’s all guys regarding the Banasthali University Admission 2019 if any queries are left please mention it through the comment box given below. We will provide the answer to your queries as soon as possible.